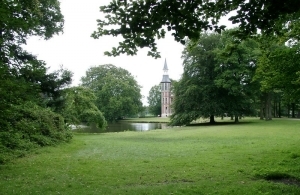 If you explore the countryside around Torhout you will almost certainly end up at the d’Aertrycke grounds. As from 1865, Ghent politician August de Maere d’Aertrycke converted these grounds into a spacious country residence. He entrusted the construction of the neo-Gothic castle to Antwerp architect Jozef Schadde. Garden architect Louis Fuchs was recruited to design the surrounding landscape park. The vast pastures and the ponds were visually separated from each other by means of oak woods. At the edge various tree species were planted to reinforce the picturesque effect of the park. The idyllic atmosphere of the landscape park is furthermore reinforced by two follies at the edge of the pond, places where a boat could moor or where the residents could retire to. From 1770 onwards the Ghent family de Potter d’Indoye bought dozens of hectares of land on the highest part of the so-called ‘Wijnendaele plateau’. They systematically brought this area of woods and heath, known as the ‘Verloren Cost’, into cultivation. The area was intersected by straight avenues. The most fertile plots were leased out as agricultural land. The rest was planted with conifers. In the course of the first half of the 19th century the family built ‘d’Aardenhutte’, a hunting lodge in a picturesque neo-Gothic style, in a remote corner of the grounds. 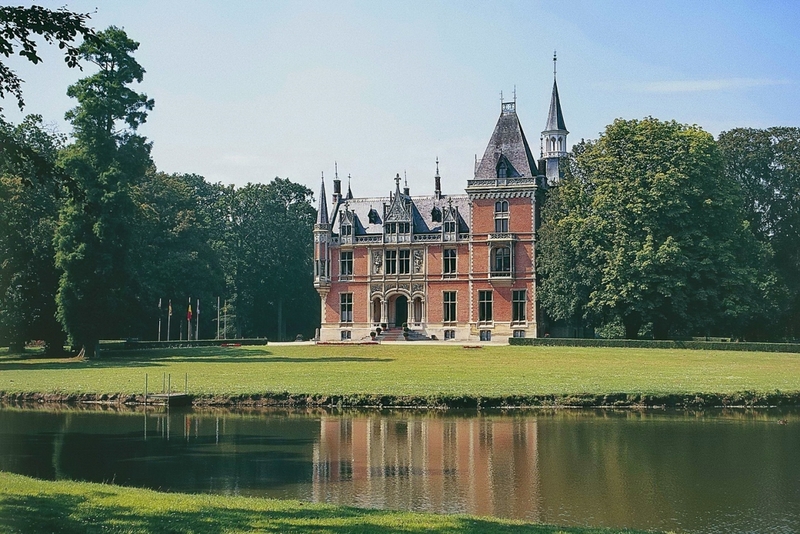 In 1865 August de Maere took over the estate and commissioned the construction of a Gothic Revival castle and the design of huge landscape park, according to the plans of Louis Fuchs, at that time one of the most renowned garden architects in Belgium. August de Maere had a vast landscape park laid out around the castle according to the plans of Louis Fuchs, at that time one of the major garden architects in Belgium. In the park Fuchs created a rural illusion on the basis of large ponds, artificial reliefs, open lawns and effectively planted groups of trees. The rear wall of the castle is reflected in a large pond, a branch of which continues into the forest. On the bank of the pond a boat house was built. It is a small neo-classicist temple with an excellent view of the castle and the surrounding green setting. For the second pond, located in front of the castle, Fuchs gratefully used the existing Mouwbeek ditch. This ditch was deepened into a winding body of water that twists through the park as a river and eventually disappears into the woods again. On the bank a neo-classicist lodge or ‘bathhouse’ was constructed. Originally, more similar folies could be found in the park. In and at the edge of the lawns all kinds of tree species were planted, creating a colourful effect with seasonal variations. In the park we can find a Giant Sequoia, a Japanese maple, weeping beeches, horse chestnuts, sweet chestnuts, planes and swamp cypresses. Winding walking paths were furthermore laid out in the woods. The construction of the park only meant a temporary conclusion of the building activities on the site. Around 1890 an ice cellar was built at the edge of the pond. The orangery dates from around 1900 and the farm was extended some ten years later. It is beyond doubt that the round pigeon tower is the most remarkable building from this period. It seems that Maurice de Maere built the tower to increase the prestige of the castle grounds even more. During the Ancien Regime not everyone was allowed to keep pigeons, as a result of which pigeon towers served as some kind of status symbol. An avenue of poplars leads from the northern edge of the wooded part of the castle park to the crypt of the de Maere d’Aertrycke family. August de Maere had the neo-Gothic chapel constructed in 1896, a few years before his death. The chapel is located on a hill planted with rhododendrons. After the death of August de Maere in 1900 the castle and the grounds remained in the possession of the family. The castle was converted into a restaurant with conference facilities in 1990. Part of the farm was transformed into a hotel and cafeteria. The grounds themselves are managed by the Provincial Government of West Flanders and are accessible to the public throughout the year. The park is open to the public all year long. The house is only open for private meetings, events etc.